The Canadian pianist Renee Rosnes, now 56, first attracted wider attention once she moved to New York in 1985 and began working with Joe Henderson, Wayne Shorter and JJ Johnson. Having kept that kind of fast company she toured internationally with her then-husband, the drummer Billy Drummond and I recall interviewing her when she appeared at Brecon with the Carnegie Hall Orchestra. Already a musical sophisticate, she has clearly continued to grow creatively, and records often; more recently with her second husband, the brilliant pianist Bill Charlap, in a duo format. Here, though, she leads a true all-star group with Chris Potter on saxophones, vibist Steve Nelson, that fine bassist Peter Washington [from Charlap’s trio] and the highly assertive drummer Lenny White. 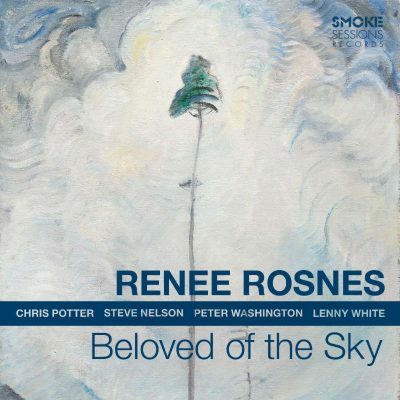 There’s a linkage in both graphic and inspirational terms to the work of the artist Emily Carr, the album title coming from a Carr painting, composer Rosnes tapping into various connections that matter to her. The opener, Elephant Dust, is quite a hectic affair, neatly voiced with Potter’s tenor and the vibes, its zig-zag shapes and running line uppermost, Potter, an old Rosnes associate, first to solo, gruff and chewy too, White bombarding the beat. A more direct response to the painter’s work comes with Scorned As Timber, Beloved Of The Sky, led off by Potter’s beguiling soprano, pleasingly harmonised, stately almost, Rosnes lyrical at the keyboard. This is cleverly wrought music, light years away from a post-bop shout-up, this further emphasised by the hymn-like Mirror Image by the late vibist Bobby Hutcherson, its dancing theme taken on by Nelson, always thoughtful, before Potter enters, combative, ahead of the denouement. Hutcherson’s tribute to his late wife, Rosie, is an appropriate follow-up, Rosnes nimble, the mood more subdued, Potter more like Henderson than Coltrane, but always brim-full of ideas, Rosnes subtle in her commentary. The cascading Black Holes and its successor, The Flame And The Lotus, call for and receive the kind of intense, applied consideration that Potter in particular is hard-wired to give, every sinew strained, the tenor’s high harmonics a constant recourse. He moves into yet harsher surroundings on the final Let The Wild Rumpus Start which gives Washington a chance to solo amidst all the liveliness, with Nelson similarly creative and Rosnes tumultuous. I liked the quintet’s version of composer Alec Wilder’s calm The Winter Of My Discontent with Rosnes at her most lyrically moving in her lengthy opening statement, Potter at his most temperate and Coltrane-ish. In sum, interesting compositions, valid explorations and fine playing from all the participants. will be good to see where Rosnes goes next.